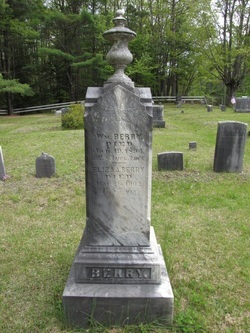 WILLIAM BERRY was born on 16 Jan 1811 in Buxton, Maine, the son of Samuel and Dorcas Berry. He died on 20 Jan 1894 [YCP #1101]; grave says 19 Jan], aged 83 yrs, 3 mos (which doesn't coincide with birth date, unless it was supposed to be days), and was buried in the Harmon-Berry (now East Buxton) Cemetery. He was married in Buxton on 29 Oct 1835 [Buxton vr Bk 3, pg 282] to ELIZA ANN MOSES. She was born 30 Jan 1817 in Buxton, the daughter of William and Ann (Milliken) Moses. 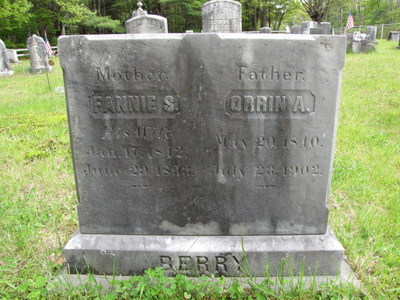 She died there on 26 Mar 1902, aged 85 yrs, 1 mo, 24 das [ME death rec], and was buried alongside her husband. i. EDWARD M (OSGOOD in vr) BERRY, b. 8 Nov 1836; d. 2 Apr 1907 in Bridgton, Maine [ME death rec]. He was married first to SARAH F EMERY, the daughter of Rufus Emery, in Buxton on 13 or 18 Apr 1856 [Buxton vr, bk 3 pg 183, pg 286] She died on 24 Sept 1861 [Buxton vr, Bk 3, pg 244]. He married 2nd, to LUCY A WHITNEY, the dau of Zachariah and Elizabeth Whitney. 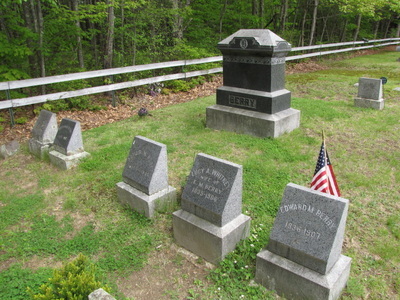 She was born in Raymond, ME in 1839 [grave], and died in Bridgton on 12 Aug 1908 [ME death rec]. 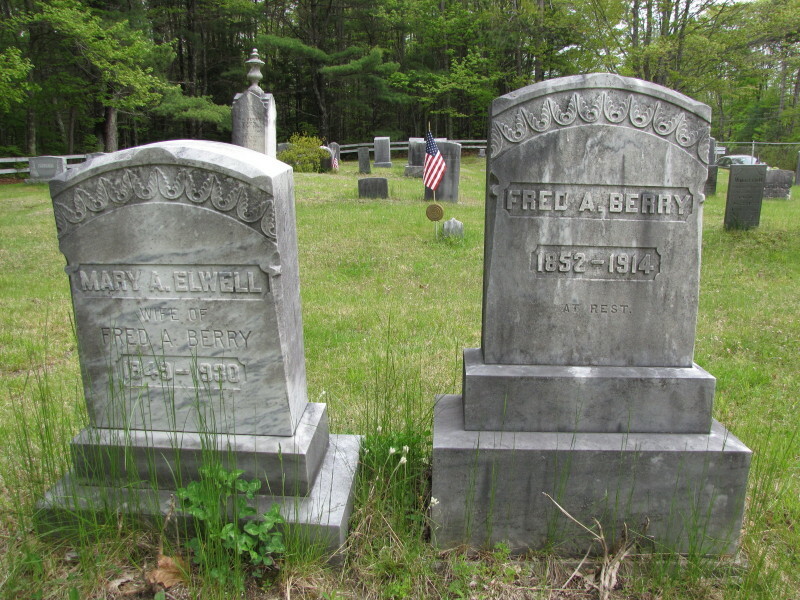 Lucy and Edward are both buried in the East Buxton (formerly the Harmon-Berry) Cemetery. ii. ORRIN (listed as Arran in Buxton vr) ALLARD BERRY, b. 20 May 1840; d. 23 July 1902 in Buxton from heart disease, aged 62 yrs [ME death rec]. He married, in Buxton on 9 Apr 1864 [Buxton vr bk 2,pg 207], to SARAH FANNY P ELDEN, the adopted daughter of Capt Samuel and Betsey (Bryant) Elden. She was born in Buxton on 17 Jan 1842, and died there on 29 June 1893. 1. William Mansel Berry, b. 20 Sept 1864; d. 1927 [grave]. Named for his uncle, who had just been killed in battle the day before. Marr to Dora (1866-1920). iii. WILLIAM MANSEL BERRY, b. 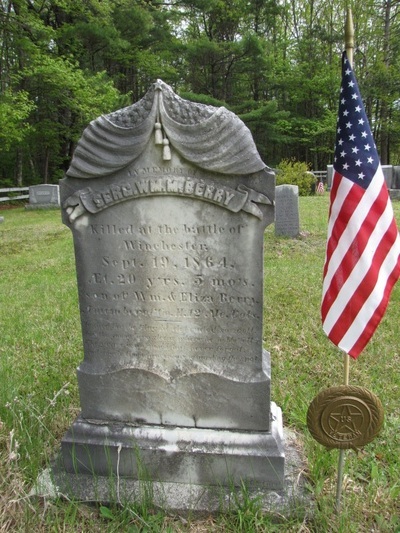 21 Apr 1844; he was killed on 19 Sept 1864 during Battle of Winchester, VA. He was a sergeant with Co H, 12th Maine Infantry. iv. FREEDOM STANDISH BERRY, b. 30 Jan 1847; d. 26 Aug 1926 [grave]. He is buried in Highland Cemetery, Buxton [YCCI, pg 385]. He married LYDIA M ELWELL on 25 Dec 1872 in Buxton [Buxton vr Bk 3, pg 240]. She was born on 26 Oct 1846 [YCCI, pg 385], and died on 6 Apr 1935 [YCCI, pg 385]. Freedom moved to Biddeford, Maine and lived most of his life, except for a brief time in San Francisco [1880 census; CA Voter Register, 1880]. He was a machinist. The 1900 census shows her as having 1 child, not living, but the 1910 one gives the number as 0.
v. FREDERICK AUGUSTUS BERRY, b. 2 Apr 1852; d 1 Aug 1914 in Buxton, a suicide by hanging following an illness of epilepsy. Marr (intents filed) 13 Jan 1874 [Buxton vr Bk I, pg 123], to MARY A ELWELL. 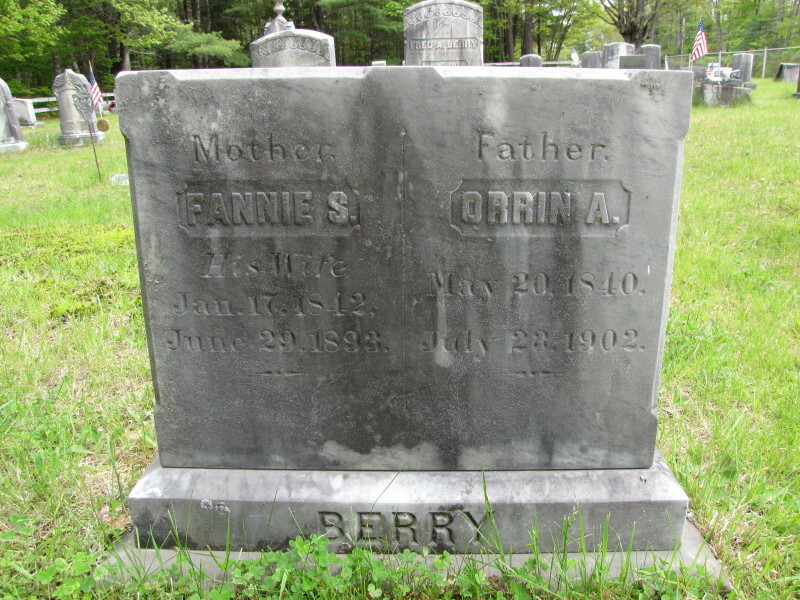 She was born in 1849 [grave], and d. 1920 [grave]. They are buried in the East Buxton Cemetery [YCCI, pg 361]. 1. Millie Berry, b. abt Jan 1876; d. 9 Sept 1882, aged 6 yrs, 8 mos [grave]. 3. Marcia F Berry, b. 1880 [grave]; d. 1892 [grave]. 4. Blanche Louise Berry, b. ca 1883.
vii. ARTHUR M BERRY, b. 26 Jan 1861; d. 1945 [grave]. He is buried in East Buxton Cemetery. He was married, in Buxton on 1 May 1887 [Buxton vr Bk 3, pg 269], to JENNIE S HILL. She was born in Buxton 7 May 1866 [death rec], and died in Charleston, IL on 29 May 1941 [IL Death Index]. She was buried with her family in South Buxton Cemetery. Arthur and Jennie were living in Amesbury, MA by 1900, where he worked as a gear maker. They divorced some time after the 1910 census. No children were listed for them in 1900 census.